dogwood blossoms!, a photo by unglaubliche caitlin on Flickr. when i realized how much my outfit matched the sweater i'm knitting from the kit kristy gave me for christmas, i decided it was time to take my first progress photo even though i'm not quite done with the first sleeve yet. 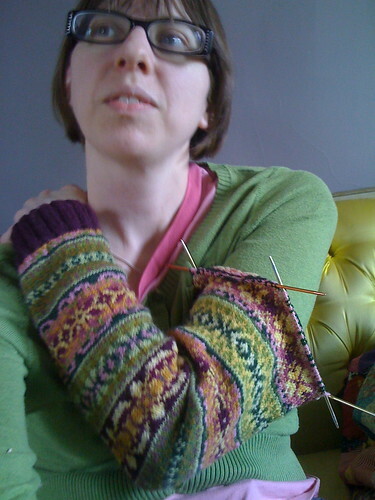 it's all about steeks- you knit both sleeves to the armpit and then join them together so you can knit the sleevecaps in the round with steeks between them. it's really ingenious. i prefer knitting top down sweaters (so you can stop when you get bored or run out of yarn) but with a pattern like this it's not like i can really make any shaping changes. unfortunately i'm unhappy with a lot of the color choices. the poinsettia pattern (second stripe from wrist) is an example of how mushy they get. i switched the order for the stripe right below the needles and i'm so much happier with it. so now i have to decide how much i'm going to make the right and left sleeve look alike (i'm thinking i better do them exactly the same) and how much i'm going to alter the patterns on the body (i think same patterns, same color, just different order.) /knitterspeak.